Economics, Civics and Commerce subjects of TREIRB Residential Colleges Recruitment Exam 2018. Applications for this Junior Lecturer jobs in Residential Colleges will be accepted through online from 09-08-2018 via TREIRB Telangana Residential Colleges website of TREIRB.telangana.gov.in. Last date to apply online for these JL jobs is 08-09-2018. Selection for TREIRB Junior Lecturer Jobs in Residential Colleges of Telangana State will be on basis of OMR Based objective Type test. Candidates who are qualified PG and B.Ed qualification they are eligible to apply online for these Junior Lecturer Jobs in Gurukulam Colleges of Telangana State TREIRB Recruitment 2018. Exam pattern and Exam Syllabus also updated here for TREIRB JL Vacancies. Available subjects are Telugu, English, Mathematics, Zoology, Botany, Physics, Chemistry, History, Economics, Civics and Commerce. RIES subject wise vacancies are given below. Vacancy details, online application process, college wise vacancies, selection process, exam pattern and syllabus, application fee, exam date, admit card release and more information about this Junior Lecturer jobs in TREIRB Gurukulam Colleges are given below. 09-08-2018 is the Starting date for TREIRB JL online application form submission. 08-09-2018 is the closing date for JL jobs application online. Exam Date (OM Based Test), Admit Card release dates will be announced later. 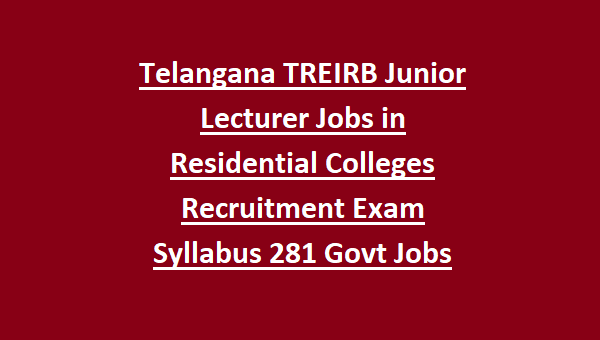 There are total 281 Junior Lecturer vacancies in this Telangana Residential Colleges Jobs Recruitment. Refer TREIRB Residential Colleges notification for Category wise vacancy details. Available subjects are given below. For subject wise and category wise vacancies refer official notification. Telugu, English, Mathematics, Zoology, Botany, Physics, Chemistry, History, Economics, Civics and Commerce. For OBC, SC,ST candidates 5 years of upper age relaxation is given. Candidates who qualified B.Ed and PG in respective subject they are only eligible to apply for this JL jobs. For JL jobs application fee is Rs.1200/- for general candidates and for others Rs.600/-. Selection for these Residential Colleges Junior Lecturer vacancies will be through OMR Based Written Test only. Written exam consists of 3 papers. All the papers are objective type. Written exam will be held objective type. For each paper 100 questions will be given and each question carries one mark. Exam duration for each paper is 2 hours. 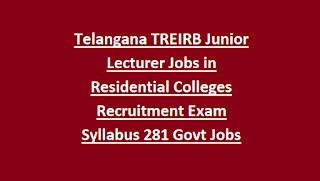 Apply online only for this TREIRB Residential Colleges Recruitment of Junior Lecturer posts. Last date to apply online for this TRIEB jobs is 30-08-2018. Official website to apply online is www.TREIRB.telangna.gov.in. Exam Pattern and Syllabus, admit card, exam result and exam key for this Residential Colleges JL jobs will be available in this website only.